Kham Krasphou|! !| left|! 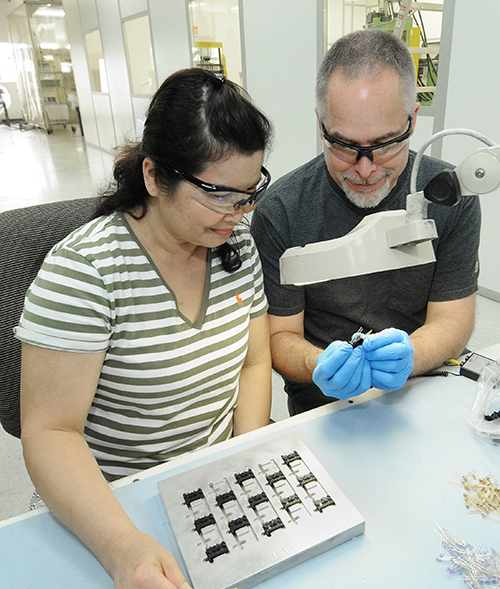 !| and Paul St. Pierre inspect parts to a bar code reader at Precision Tool and Die in Derry. How tough it is to recruit employees in this tight labor market? One Lakes Region manufacturer had to resort to the county jail to find workers. And he isn’t the only one. And the labor shortage is not limited to the Lakes Region. “Getting tradespeople is impossible, absolutely impossible,” bemoaned Donna Basinow, office manager at Precision Tool & Die, an injection molding firm, in Derry. “It’s really crazy. I’ve never seen it this tight in 30 years,” added Tracy Madden, president of McIntosh Staffing Resources, in Dover. Don’t believe the anecdotes? Look at the statistics. • The state’s 3.8 percent May unemployment rate (3.6 percent without the seasonal adjustment) is the lowest since 2008. • Some 11,000 jobs have been added in the state since May 2014. • Initial unemployment claims in May were the lowest they have been since 2001 – over two recessions ago. • The manufacturing sector, once in decline, has gained about 1,000 jobs since last year. It’s not so much a particular skillset that he’s looking for either. “It’s getting people who show up to work on time and adhere to company policies,” said Vanover. All of this competition for labor has pushed up wages. In April, manufacturing wages broke the $20-an-hour barrier after languishing in the $17 and $18 range for decades. The average manufacturing workweek is up to 42 hours. And these are usually high paying in the high-tech industry, especially in New Hampshire, where the industry is more manufacturing-related, as opposed to Massachusetts, where it is more software and service-related, said Dennis Delay, economist with the NH Center for Public Policy Studies, in Concord. There is also particularly strong growth on the Seacoast and in the Lebanon area due to their proximity to educational institutions. 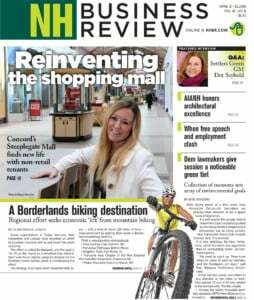 The tech sector is particularly booming, said Matt Cookson, executive director of the NH High Technology Council, not only due to expansion, but because of more startups. Wages are creeping up all over. In the private market as a whole, average weekly earnings rose 4 percent from May 2014 to May 2015, after being flat for years. It’s not just employment. The economy has been heating up on a number of levels. Business taxes for the first four months of the year, for instance, are 38 percent of what they were in 2014. Sales and price increases in May were in the single digits compared to last year, but put them together, and total volume is up 12 percent, with pending sales up 13 percent. And with the foreclosure crisis over – in April foreclosure deeds fell below 100, the first time since 2006 – inventory is shrinking. There are 1,000 fewer homes for sale than there were a year ago. And that means more of a demand for new housing, though you couldn’t tell from the construction statistics, because there wasn’t a heck of a lot of building in the winter, though there was a strong surge in April, and in May there were 11 percent more construction jobs than in 2014. The market has gotten strong enough that Ashwood Development Company is building on speculation again, and those houses are selling. This is good news to the construction industry, which has suffered since the recession because of scarce funding for road construction, though that’s improving in New Hampshire because of last year’s gas tax. “It is on the commercial building side that there has been a lot more activity,” said Gary Abbott, executive vice president of Associated General Contractors of NH. business is now commercial site work, as compared to one-third in the past. Still, that is more than enough, said Ronald Severino. “We are booked for a year and are probably at the point of having to turn away work,” he said. There is also a shortage of desirable commercial and industrial space, said Christopher Norwood, president of NAI Norwood Group in Bedford. Old buildings are either taken or are not appropriate for modern technology, with its demands for energy efficiency and larger clear height for inventory storages. “Industrial has been doing the best in terms of rebound,” he said, but there is also the need for warehouse space and fulfillment centers. The biggest demand is near the airport and by the Massachusetts border, said Norwood. “A lot of their recruits come from Boston and want to live close to that area,” he said. More construction means a greater demand for materials, at least in the United States, and that’s a blessing, since lumber exports to China have fallen off, said Jasen Stock, executive director of the NH Timberland Owners Association. But his industry still has trouble finding workers, particularly in transporting goods. The booming tourism industry is partly to blame for the tight labor market. It started off with a strong winter, the fourth best season ever, with some 2.5 million visitors last winter. As for summer, “for the most part, advanced bookings are very good,” said Mike Somers, CEO of the NH Lodging and Restaurant Association. Overall, state rooms and meals tax revenue through April was up by almost 10 percent. Even in the off season, hotel occupancy increased to over 52 percent and rooms revenue is up by 9.4 percent. Indeed, hotels employed 12 percent more people in May than at the same time last year. Ed Freich, general manager of the Sleep Inn Manchester Airport in Londonderry, has noticed the increase in business. Many are outside contractors needed working on development projects around the airport and beyond who need a place to stay, though Freich attributes some of increased business to a new park and fly service. Business at Great NH Restaurants (owner of Cactus Jack’s, T-Bones and The Copper Door) is up nearly 5 percent over last year, which wasn’t a bad year, said CEO Tom Boucher. And most of that is local traffic, he said. And even though Boucher’s entry-level wage is $10 an hour, he’s having a hard time getting workers, particularly in the Lakes Region. “Finding employees has always been a challenge in the summer, but this year it’s been the most challenging since 2000,” he said. The snowy winter didn’t help, particularly for auto dealers, who were snowed in over Presidents’ Day weekend, but things have picked up during the spring in both sales and service, said Pete McNamara, president of the NH Automobile Dealers Association. And labor is hard to come by, so much so that dealerships have resorted to cannibalizing labor from each other. “I hear it’s dirty fighting when one shop steals an employee from the other,” he said. “They are not flattening tires,” but they have been increasing wages, he said. The labor shortage has affected retailers of all sorts. Malls are holding job fairs in order to attract summer help. Though, the retail sector did employ 1,800 more workers in May 2015 than a year earlier.